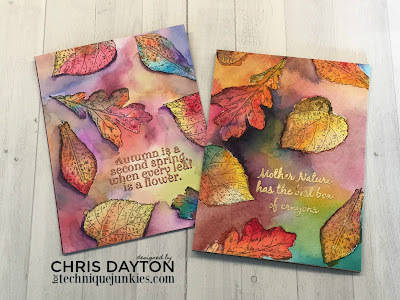 Today I am sharing projects created using a fun new-to-me painting medium and this new Autumn stamp set from Technique Junkies. Chances are it's likely not new to any of you, but it is very recently new to me! It's a technique that I'd heard about for a long time, but finally experimented with just last week for the first time: painting with Ken Oliver Color Burst powders! I can't believe it took me so long to try it! I'd have been hooked long ago! They are so fun and easy to work with. I'm working with this new set from Technique Junkies, called Autumn. And here are two cards I have made with this set and the Ken Oliver Color Burst powders. I used my MISTI to stamp my images onto Fabriano Artistico 140# cold press watercolor paper with Versafine ink. I then used a wet brush to pick up tiny bits of the Color Burst powders from my palette, which literally was my craft mat. I painted the backgrounds first, then the leaves. I added some shadow color to further define the images from the background. The video below shows the process of creating the card on the left, and also shows a few tips for correcting errors in cardmaking, including a tip for re-stamping a stamped image, and my trick for removing stray melted prembossing powder. This is just so beautiful. Thanks for the video! Thank you, thank you, for sharing your talent. Thud!!! This is gorgeous! Thanks for sharing. love it! Great job and inspiration for me! Wow! This is such a beautiful card... I will have to pull out my Color Burst and try this technique! Wow. The colours are just perfect. Adding the black to the edges really brought your leaves to life. Thanks for that tip, and for the tip of heat embossing after you already stamped out your sentiment. Very clever. Wow Chris that was awesome! Gorgeous! When you added the shadow, I was like OMG! Amazing! Gorgeous cards.Need to try this technique. Can't wait to watch the video! I love your cards!